Anyone who said the Pitt volleyball team’s 12-1 start was a fluke, because they had not yet faced tougher ACC competition, now has less to talk about. The Panthers captured their first ACC win of the season on Sunday and, after five days off, they come back to play an even tougher opponent in a North Carolina team ranked 12th in the nation. Despite facing a ranked opponent for the first time, senior Kate Yeazel has no doubts that the team can win. “We are a pretty evenly matched team, so it’s going to come down to the serving and passing game. Who can serve harder and pass better,” Yeazel, who plays opposite, said. Pitt will host North Carolina Friday at 7 p.m. for its ninth straight home match. The visiting No. 12 Tar Heels (10-2, 1-1 ACC) come into the Fitzgerald Field House with their two losses of the year being both on the road and to ranked teams. UNC lost to then-No. 11 Illinois on Aug. 30 and to then-No. 6 conference foe Florida State last Friday. The Panthers have won eight straight matches, as well as their last 10 matches at home dating back to last year. Even with this record, Fisher said it doesn’t mean much. The last time Pitt faced the Tar Heels was in Chapel Hill, where the visiting team dropped the match 3-1. But this season may be different, and the Panthers will try to add to the successful start to the season thus far. Not only does the team find itself ranked at the top of conference leaderboards, but, individually, the team has a handful of players in the top categories as well. 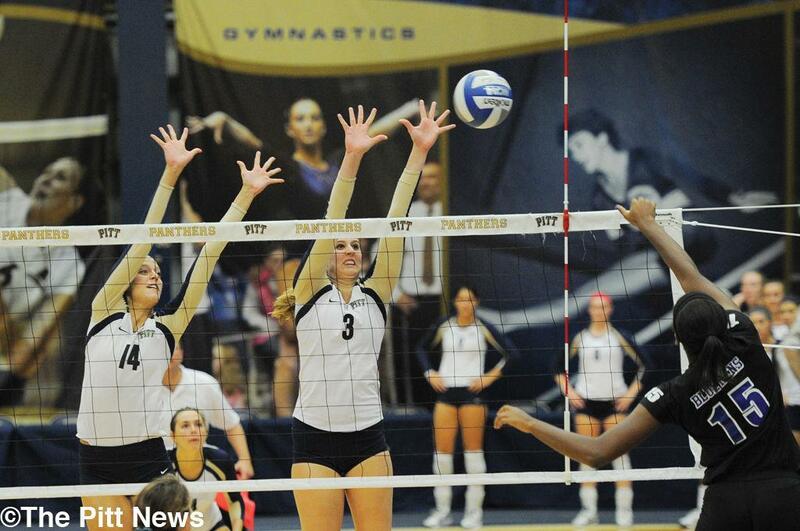 As a team, Pitt ranks fourth in the ACC in hitting percentage with .289. The Tar Heels, who have a .175 hitting percentage, will be faced with the Panthers’ league-leading opposing hitting percentage of .084. Opponents struggle against the Panthers at the net thanks to defensive plays from Yeazel and junior Amanda Orchard. The opposite and middle hitter are tied for third in the conference, averaging 1.67 blocks per set. If UNC can get the ball past the middles, Delaney Clesen and her teammates should be able to stop them. As a team, Pitt averages 16.67 digs per set, with the senior libero accounting for 6.33 of those. According to Guess, serving should be one of the Panthers’ strengths this season. One way Pitt hopes to do that is not giving UNC the chance to play the ball. Both setters for Pitt, Lindsey Zitzke and Jenna Jacobson, average almost one ace per set. UNC, however, is as strong of a competitor as the Panthers. In preparation for this match, Yeazel and the team have been watching film and scouting the visitors, trying to learn their tendencies. “All of the players are good. They don’t have a weak link,” Fisher said. Fisher said the team can’t pinpoint one area to focus on to stop the Tar Heels, who boast a seasoned roster. The team knows that pulling out a win could be difficult, but said that it isn’t unattainable if the Panthers follow what they have practiced all week. “We have to worry about them a lot but we also have to worry about our side of the net—making sure we get stuff done on our side of the net,” Guess said.